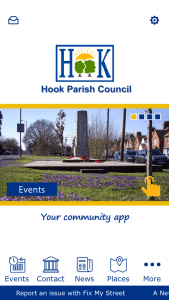 Launching the Hook Parish Council App – We are delighted to introduce a new App for Hook. This offers a great opportunity for residents to receive the latest information about local events and activities and to communicate directly with local groups, organisations and businesses using a Tablet or Smart Phone. We are also proud to lead the way, with the only Council App in Hampshire. Search for ‘Hook Parish Council App’ on the App Store or Google Play. Places – This button opens a map of Hook. Click on the place pin and to directly access information about, or communicate with, the organisations shown. Closing date for nominations is by 27th April 2018. Tennis Coaching at Hartletts Park – In addition to offering the Junior School exclusive use of the courts for coaching, we have recently agreed to allow a private coaching company to hire the courts for individuals and groups. When not in use by the school or for coaching, the courts will remain free to use, on a first come first served basis. Hook Road Race and Fun Run – A reminder that the Community Centre Car Park will be CLOSED on Sunday 20th May, for the Annual Hook Fun Run and Road Races, which set off from Hartletts Park at 10.00 am. Why not come along and join in the fun. Cemetery Memorial Testing – Under the Parish Council’s duty of care and upkeep of burial grounds, memorial assessments will be undertaken in the near future in both Hook cemeteries. In some cases it may be necessary to lay the stones flat; in others, remedial work may be required to ensure safety. To ensure work is carried out sensitively, if you know of, or have any connection with a grave in either cemetery or have any concerns regarding the memorial works, please contact the Parish Council office as soon as possible.